A free to read online newspaper from Independent journalist blogger Denny Lyon. Sit back, relax, get informed, cook a little and laugh a lot. 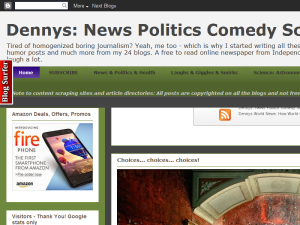 This what your Dennys News Politics Comedy Science Arts & Food Blog Ad will look like to visitors! Of course you will want to use keywords and ad targeting to get the most out of your ad campaign! So purchase an ad space today before there all gone! The Social Poets: Saturday Special: Comic Seth Meyers Analyzes GOP Convention As Intellectually Obscene Screw-Up? If you are the owner of Dennys News Politics Comedy Science Arts & Food, or someone who enjoys this blog why not upgrade it to a Featured Listing or Permanent Listing?